Marilyn and Bobby Kennedy first met on February 2nd, 1962 at the home of Patricia and Peter Lawford (Patricia was Bobby’s sister). Following on from this, Marilyn and Kennedy were to meet regularly. The most notable of these meetings was on the weekend of March 23rd-25th, 1962 at the home of Bing Crosby in Palm Springs. JFK attended the party but, until now, no one has considered whether Bobby was there too. Both Kennedy’s travelled to California together on the Friday, with JFK going on to Palm Springs, and Bobby heading to Los Angeles. Bobby had dinner with his sister Patricia Lawford and on Saturday March 24th, made a speech at a conference on crime prevention. 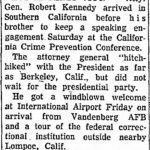 Unusually, Bobby was not seen again publicly until he returned to Washington with JFK from Palm Springs, on the night of Sunday March 25th. Marilyn travelled to Palm Springs on Saturday March 24th by car. According to Joan Greenson she prepared for the trip at the Greenson residence due to the water being switched off at her new home on Fifth Helena Drive. Whilst in Palm Springs, it was suggested by Ralph Roberts (Marilyn’s Masseur) that Marilyn had a one night stand with JFK. I would question this, as, although he claims to have spoken to a man with a Bostonian accent that night, he never identified himself as JFK, nor did Marilyn say it was him. Also, if she were travelling down to spend time with JFK, why did she not go down the day before when he was there? 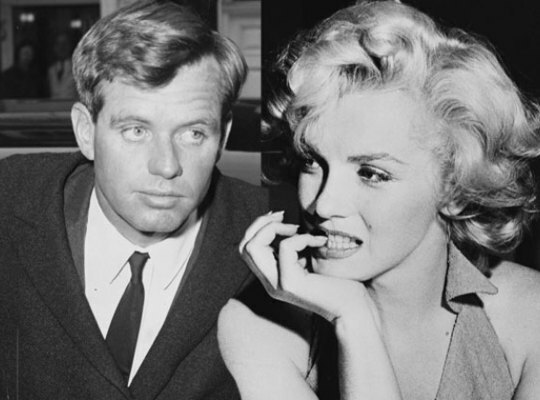 I would suggest that Marilyn was in the midst of an affair with Bobby Kennedy, and it was he that Roberts spoke to that night. RFK arrives in LA and says he does not know if he will travel back with JFK from Palm Springs. The fact the two arrived home together places RFK in Palm Springs that weekend. 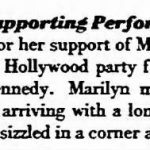 In May 1962, Marilyn famously sang ‘Happy Birthday’ to JFK at a Democratic fundraiser in New York. Bobby Kennedy was pictured with her and JFK after the show and it is the only known photo of them together. By June 13th, 1962 Marilyn had been invited to a party the Kennedy’s were hosting for the Lawfords back East. She declined, using her fight to get back to work as an excuse, but it might be more plausible that she didn’t want to attend due to Ethel being there. During a party at the New York home of movie executive Arthur Krim, Marilyn stands between Robert & JFK. The party followed a democratic fundraiser at Madison Square Garden honoring JFK’s birthday where Monroe famously sang Happy Birthday. Then you have Marilyn’s outgoing phone records. Wouldn’t you know, every Tuesday in July 1962, she placed a call to the Justice Department in Washington – where Kennedy’s office was. People argue, “Oh, well, she was trying to get him to help with her ongoing fight to be rehired on Something’s Got To Give.” Really? This is a woman who took on 20th Century Fox over the terms of her contract, and won, just a few years earlier. A woman who had been suspended and rehired on more than one occasion. The fact that discussions with the studio had already been ongoing at this point would also lead me to believe that Kennedy had no part in this. There is also the argument that she was ringing the office of the Justice Department – not Kennedy’s office directly – but we’ve never had access to her incoming phone calls and he was said by Angie Novello – his personal secretary – to have been returning her calls directly. Understand that you and Bobby are the new item! We all think you should come with him when he comes back East! 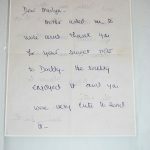 In my opinion, this note seems to suggest, that Marilyn Monroe and Bobby Kennedy had some sort of an affair. Do you see the difference in those two statements? In 1984 Summers found the note and asked for clarity on it. Kennedy Smith was probably shocked to hear about the note again and denied knowledge of it. Yet ten years later when asked again, she all but admits writing it, claiming it was written as a joke. I would suggest that Jean Kennedy Smith wrote that note in 1962 believing that no one would ever see it again. She wasn’t to know that Marilyn would die that summer or that the note would be kept and eventually published for the public to see. It’s also very important to remember that the note from Kennedy Smith is not dated. 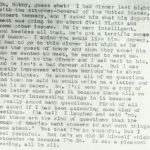 While it’s been said that Marilyn spoke to Joseph Kennedy at the Lawfords dinner party, it appears, from the note, that she wrote to him on another occasion. 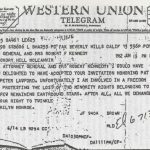 Kennedy Smith’s letter could have been sent any time between that first February 1962 meeting and August, before Marilyn’s death. People have argued about a Kennedy affair for years now. Many believing the salacious rumours of Marilyn having affairs with both brothers at the same time, but if you research it and look at the sources of information, you will likely come to the conclusion I have, that there was no JFK affair at all. Bobby however – I now believe, and would suggest to you – had an affair with Marilyn from approximately February 1962, right up to her death. 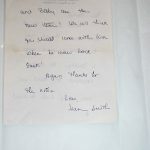 Newbridge Silverware purchased the note from Jean kennedy Smith at auction last year and will have it displayed in their Museum of Style Icons from January 2018. If you are living in Ireland you should most definitely make the trip to Newbridge to see it on display! 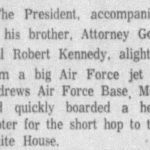 Special thanks on this article goes to April VeVea of Classic Blondes website who helped me source newspaper clippings and helped me piece together Kennedy’s movements on this particular weekend in 1962.